Well, that’s the way it goes. 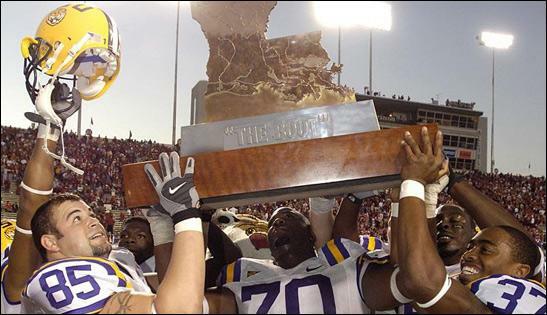 The Boot goes to Arkansas and LSU is relegated to an “also ran” again. Too bad. However, it was theirs to lose and they couldn’t convert….in triple overtime….at home. If you can’t secure an inferior opponent at home, you don’t deserve a shot at the National Championship. I still love the Tigers, but don’t think they are deserving of a National Title shot. 10-1. #1 Ranking. Favored to take it all. Today, 25 Seniors at LSU — the last of Nick Saban’s recruits — will make their final walk down Victory Hill and into Tiger Stadium to take on a mediocre Arkansas Razorback team. While these Seniors have played every game of their storied college careers as ranked opponents, none of them were part of the team when Arkansas last beat LSU. Last year, the Hogs (due to a soft schedule) had sewn up the SEC West before the LSU meeting. LSU beat the Razorbacks in a tough game in Little Rock, 31-26, securing a Sugar Bowl birth but no SEC Championship shot. While LSU didn’t represent the West in the SEC title game, they did end up beating the snot out of Notre Dame in the Sugar Bowl to secure a final #3 ranking. The West “champion” ended up losing to Florida in the Championship game, 38-28 and to Wisconsin in the Capitol One Bowl, 17-14 and ended up with a #15 ranking. Today, the Tigers have sewn up the West title and will play in Atlanta in a couple of weeks. The Razorbacks come to Baton Rouge unranked and 3-4 in league play. Their coach, Houston Nutt, is likely on his way out. But, he’s a crafty little devil and there’s nothing more fierce than a wounded animal, so LSU needs to stay on task and finish this thing up right. Their quest is bigger than just the SEC — it’s for the National Title. There can be no more losses — particularly, not Arkansas at home. Forget the Miles to Michigan talk and if they’ll play Tennessee or Georgia in Atlanta. Today is about pounding the Hogs…for “The Boot”, for the SEC West, for the SEC, and for the National Championship. Hopefully, these 25 talented Seniors will provide the leadership and focus needed to secure this victory and march on to Atlanta for the next leg in the Championship journey. Perhaps, a little We Ready would be appropriate for the lockeroom…. GEAUX TIGERS! ROAST THOSE HOGS!